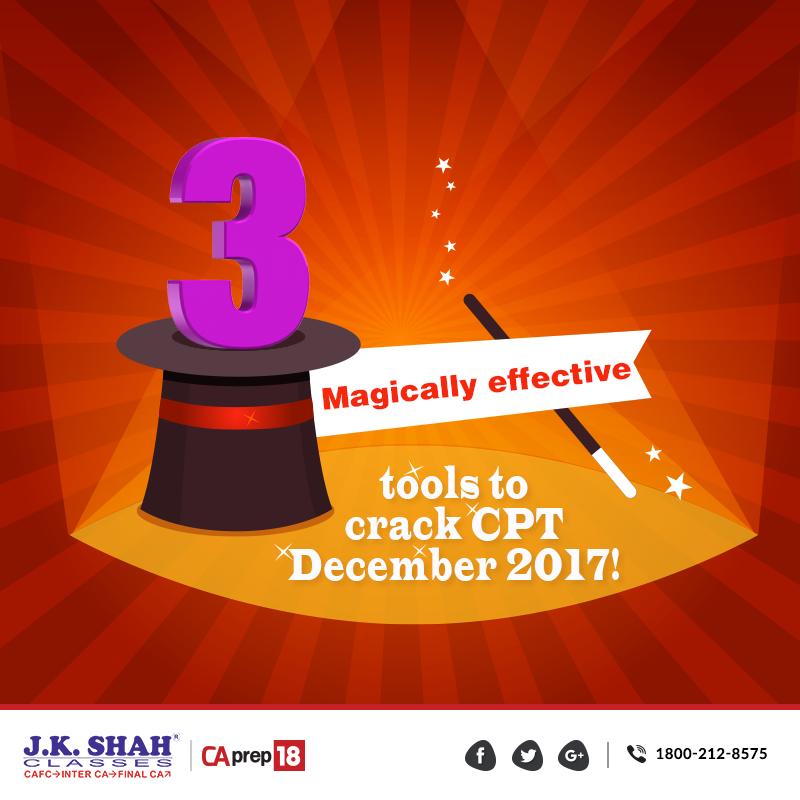 3 Magically effective tools to crack CPT December 2017! You have been studying CPT for a dinosaur age now and here it is, standing right in front of you, staring straight into your eyes across the smokescreen of a month’s time- CPT! Panic not! Indeed it is the turmoil time when you are unsure of what fate and ICAI CPT brings to you, but one thing that remains constant amidst all the confusion and tension is that ‘Practice makes a CPT student perfect’! Today I thought of sharing a very simple yet undiscovered truth behind the success of every individual who has cracked CPT and moved one step ahead towards his CA dream, the three secret effective tools are… Wait! Before I reveal the tools, lets promise yourself to religiously follow the material given to you because trust me, this has worked every single time! A.Mock Tests- Mock tests at this point of time are the Batman to your Gotham city; meaning Mock tests have the real potential to save you from a bad landing, choose your Mock tests very wisely as they will decide your overall performance on the basis of the questions framed by the particular Mock test provider. Try this Mock Test, it is designed with so much precision that it proves to be the exact replica of the expected CPT paper and since it is being taken by a number of CPT aspirants all over the nation it exposes you to the competition out there put by your fellow CPT aspirants; hence, make this mock test your CPT buddy! B. Past years’ CPT papers- Referring and solving Past Years’ CPT Papers will give you a crisp idea of the upcoming CPT. ICAI has a record of introducing academic changes almost every year, nevertheless there is nothing more relevant and dependable in terms of practice than the Past years’ CPT Papers. You do not need to practice the past year papers daily but keeping in touch with them will definitely help you in the long run. C. Sample Papers- Let us consider this as the traditional and long term investment while having a clear picture in mind that this being a helpful tool is not to be highly prioritized, fact apart; if you are done with your concept clarifications and can manage time to solve Sample Papers simultaneously then these handy little saviors called CPT Sample Papers are available online and can fill the room for practice if you have any after attempting Mock Tests. Practice! This is the time to only practice. Its just about a month of go for the exam day so start following the dusty time table sheet kept hidden under your study table and keep that confident spirit up with your eyes only on the goal and in no time you will be through CPT. Good luck! Keep excelling with CAprep18.